The bi-coastal flute and percussion duo, A/B Duo, will celebrate the release of their album “Variety Show” by performing works from the album. Fellow Aerocade Music artists and everyone’s favorite renegade saxophone+bassoon duo, Post-Haste Reed Duo, will come down from Portland to split the bill with A/B Duo. Flutist Meerenai Shim and percussionist Christopher G. Jones will perform works by Andrea Reinkemeyer, Ned McGowan, and Ian Dicke. 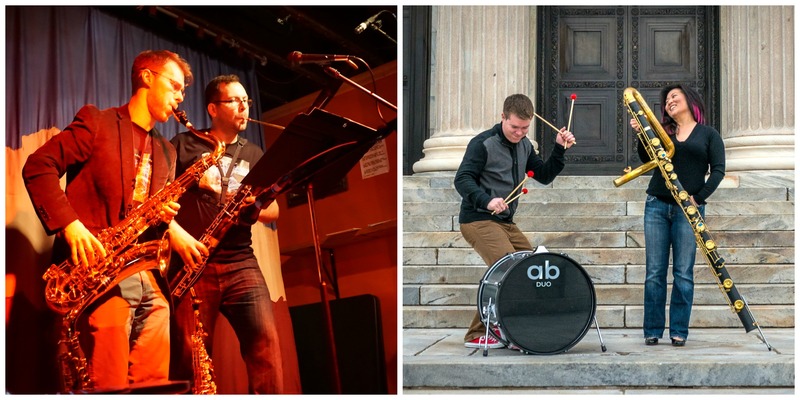 Saxophonist Sean Fredenburg and bassoonist Javier Rodriguez will perform works by Simon Hutchinson, Louis Andriessen, Lanier Sammons, and Ethan Wickman. CDs will be available for sale. Snacks and non-alcoholic drinks will be served. All attendees will be entered into a raffle for Aerocade Music swag.